In association with the Open University, the BBC is helping to coordinate a distributed computing project to model climate change. The model used is a Monte-Carlo simulation. I.e. we don't know all the variables so we make millions of models with slight differences and then see what happens. This allows us to make informed decisions about the confidence we can have in our predictions, as well as the sensitivity to certain variables. This is something everyone can take part in (even someone who simply doesn't believe the current thinking on the subject of climate change - improving the models could help prove their point, or more likely in my opinion to show them that they need to change their views). It would be lovely if large organisations with many machines could join projects such as this one - there is both an educational payoff for the users of the machines, and it doesn't cost the organisation anything that they're not already spending in electricity. Once installed they can edit their preferences and join a team which displays joint results for every machine in their organisation (grouped by school/business/social group/whatever). The project is newly launched, and so as of right now there do not seem to be many teams. One could argue that this would encourage computers to be left switched on, but apparently as long as monitors are switched off the system uses less energy per calculation than a mainframe would. Other distributed computing projects include factoring large numbers (with cryptographic applications), SETI (the search for extra-terrestrial intelligence), an experiment into protein folding (useful for medical applications), Pulsar Calculations and so on. 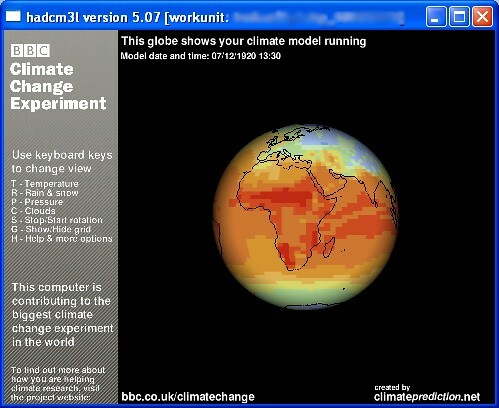 (The Climate change screensaver was produced in conjunction with SETI). BOINC or the Berkeley Open Infrastructure for Network Computing is the name of some software that the various projects 'fit' into. Additional: The BBC installs the BOINC project manager, one can use this to run the other projects by 'attaching a project'. One can also show the simulation running without going to the screensaver via the project manager (which appears in the toolbar icons).